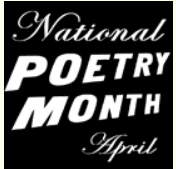 April is National Poetry Month and Public Radio 90 is continuing its tradition of showcasing the work of area poets, from NMU students to regional writers. Each weekday morning at 9:37 a.m. and again in the afternoon at 3 p.m. tune in to hear the work of these wonderful, local writers. Jaci Millette, from Escanaba, is a senior at NMU, Majoring in English with a minor in writing. Cory Ferrer is a 1st year student in NMU's MFA in Creative Writing program, who hails from Traverse City, and received a BA in Engligh from the University of Michigan. Genean Granger is currently a graduate student in NMU's MFA in Creative Writing program. Katelyn Durst is from West Branch, MI, and is currently a senior at NMU, studying poetry. Diane Sauter is currently a Professor of English at NMU. Mike Brennan holds a BS in English and Film Studies, and a double MA in Creative Writing and Poetry from NMU. He has been published in both online and print journals, and two writing anthologies. The poetry heard here is from an as-yet unpublished collection called Postcards from Exile. Carol Oberg, who lives at Goose Neck Lake in the Hiawatha National Forest, studied at Bay de Noc Community College. Her work has been published by Blue Mountain Arts, a Christian literary magazine, where she was nominated for a Pushcart Prize, and soon in "The Fourth River" an anthology published out of Chatham University in Pittsburgh, PA.
Zara Moeggenberg is a graduate student in NMU's MFA in poetry program who hails from Bay City, MI. Milton Bates is a retired professor from Marquette University in Milwaukee, and now reads with The Marquette Poets' Circle. Michael Greer is a retired flute smith from Royal Oak, MI, who has now relocated to the U.P. for the sixth time.